The Son of Neptune continues from where the Lost Heroes left off and is the second book in the Heroes of Olympus Series. While Lost Heroes was about Jason, it is very natural that The Son of Neptune is about Percy. 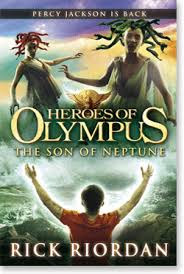 I really enjoyed Son of Neptune as Percy is still very much my favourite demi-god created by Rick Riordan. In Neptune, Percy found himself in the Roman camp and being unaware of who is he. Basically, he is experiencing what Jason went through in Lost Heroes but in a more Percy way if that is even possible. While in the Roman Camp, he actually met Nico Do Angelo but Nico pretended that he didn't know Percy. Now, that was really strange but then you are reading a book on Greek gods after all and strange has always been the theme of the series. Next up is The Mark of Athena and if you know who the daughter of Athena is, you would know what the story focuses on. Wait for my review of The Mark of Athena coming right up.